Well, first a bit of an explanation. I promised this recipe several months ago, but I’ve had a bit of an unexpected (but lovely) career change recently. I’ve just started a full time DPhil in Early Modern Literature, but the whole process from writing a proposal to actually starting all happened in the space of about 2 months. As it all came about rather suddenly I pretty much had to drop everything to get things sorted out. 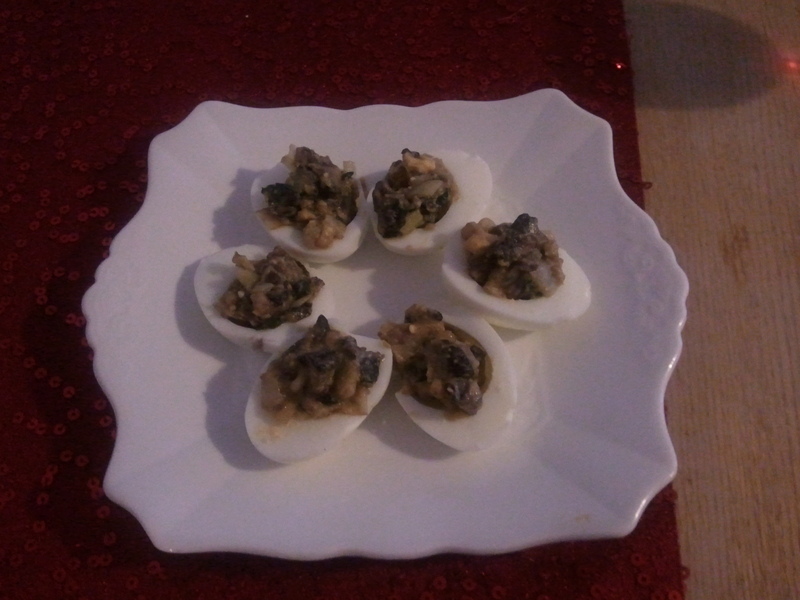 Anyway, I’m back again (again), with the long overdue conclusion to the stuffed eggs post! Take sweet Herbs, as Lettice, Purselen, Burrage, Sorrel, Parsley, or Chervel, and a little Time, take out the stalks from the said herbs, and if you will have your stuft eggs to bee high rellished, put the more Parsley into them, or the more Chervel, and a few Leeks or Onions, your said herbs being thus well picked and washed, cause them to bee minced, and season them with salt, with a little beaten Cloves, or Pepper; so likewise may you mince joyntly with your said herbs some Muscharoons well washed and picked, which have been formerly seasoned and boyled, and some persons do also add thereunto some Cheese grated or scraped very small, pour all this said mixture into a skillet, and cause it to be fryed with brown butter, or with any other suet, or with oyle, in case you have it. And when this your said mixture is half fried, some do add thereunto some few Currans, and Pineapple Kernels, which is only to bee done at your own pleasure, being otherwise not requisite, and it will suffice only to season them with salt, and when this your said stuft mixture is fryed, you must put unto them some hard yolks of Egges cut in small peeces, and give them a turn or two in the panne over the fire, after which dish them up, and garnish the said dish on the top and sides with hard Egges cut in twain. Sometimes you may take out the yolks of your said Egges, and mingle them with your minced stuft ingredients, & when your said Pudding is fryed, you may fill the white of your Eggs therewith before you pour it upon the rest of your pudding, and sometimes instead of ranging of the white of your Egges about your pudding, you may garnish it with some sippets, or with small cakes of paste fryed in butter, and after all you may grate upon the whole a little Nutmeg, or crust of white bread. I began, as instructed by boiling the eggs. 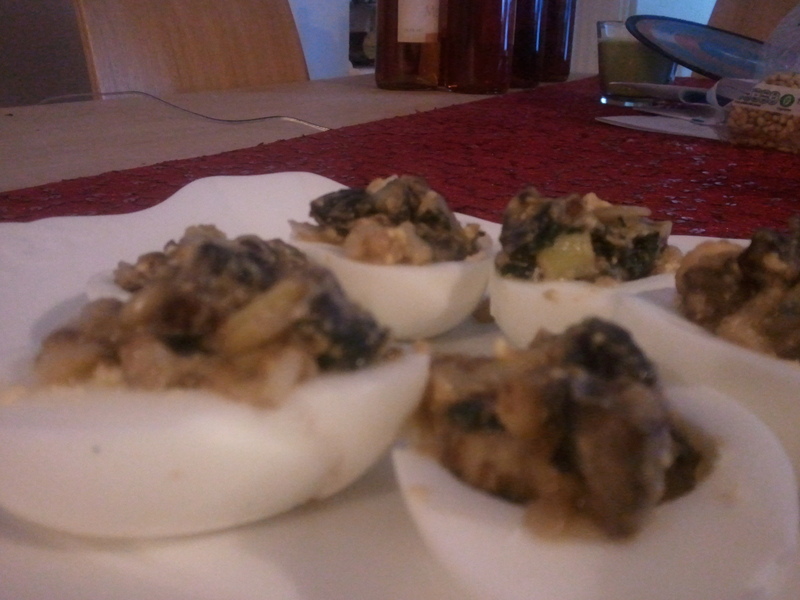 The recipe also called for boiled mushrooms, so I popped a portabello mushroom in there with the eggs for a while. 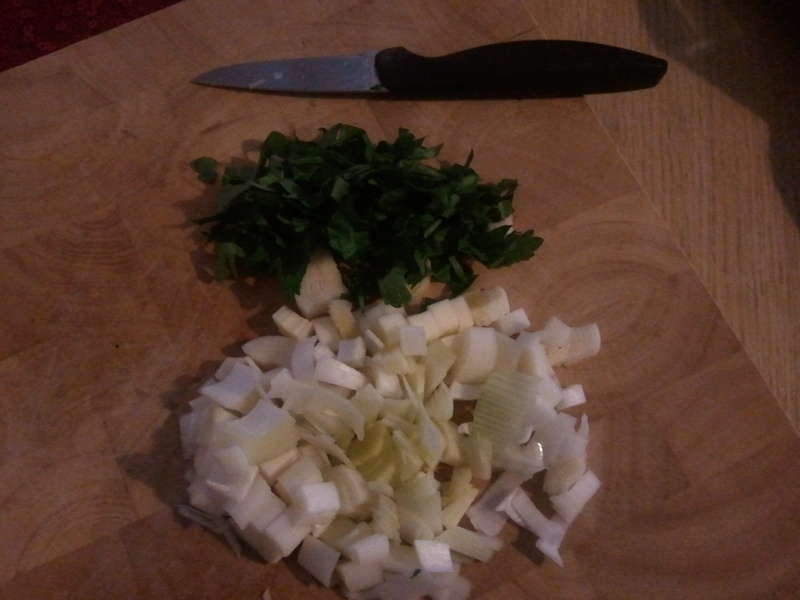 Next, I chopped up the leek and parsley as small as possible. The smaller the better for this I think, you could use a food processor but that’s not really in the spirit as I like to avoid it where possible. Unfortunately I could not lay my hands on any of the other herbs suggested in the recipe. My greengrocer only tends to stock two types of herb at a time for some reason, and all they had this time was large bunches of parsley. When I went in yesterday they had tarragon, which would probably have been nicer. I chopped up the mushrooms and mixed them with the leeks and herbs, together with a pinch of pepper and a little grated cheese (I used Sussex Charmer, which is currently my favourite hard cheese). It seemed slightly unnecessary to add the cheese this early on, but I did it anyway. I then proceeded to melt about 1 1/2tbsp butter in a frying pan until it bubbled and turned brown. Learning from my mistakes with the beans, I used actual butter, and I didn’t go overboard. To be honest, I probably still used a bit too much though, but that is something I generally have a tendency to do, it seems. 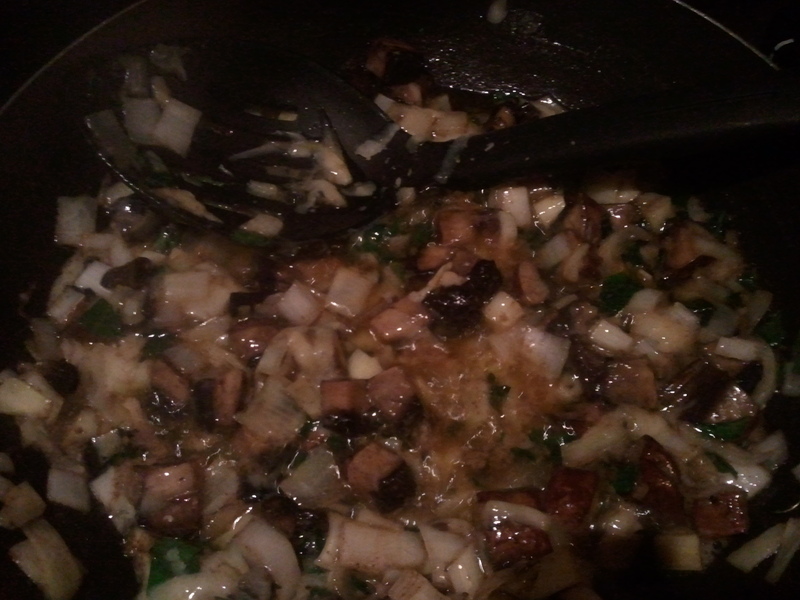 I fried the leek and mushroom mixture for a few minutes before adding the pine nuts, aka pineapple kernels. I had a quick look at the OED, and sure enough pineapple kernels are indeed the seeds of pinecones. I imagine they do not come from the Mediterranean stone pine as they do today, but I think this will be near enough. Then I cut the eggs in half, took out the yolks, and crumbled them into the mixture. After frying for another minute or two I put the mixture into the egg whites. Put the eggs into boiling water and cook for 4 minutes. 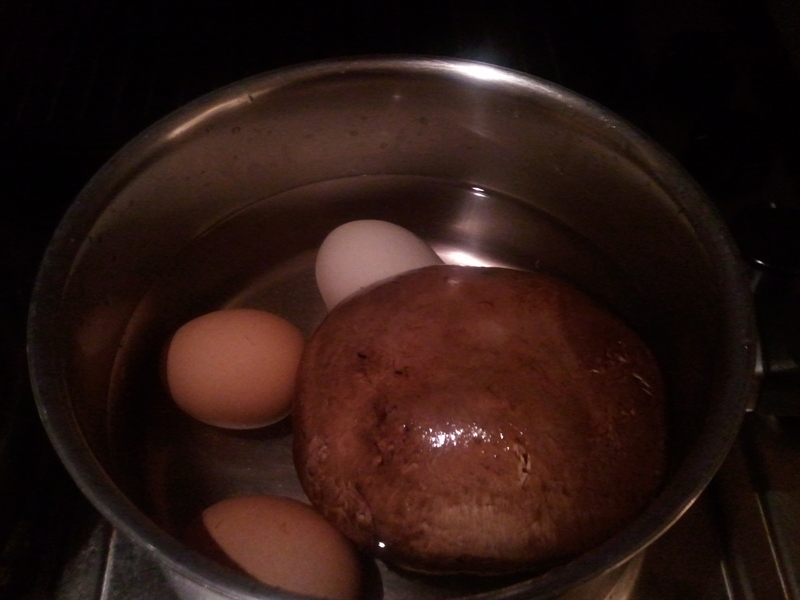 Add the mushroom and boil for a further 4 minutes. Drain and leave to cool. Chop the leek, parsley and/or tarragon, and mushroom. Put into a bowl with the cheese and add a pince of pepper. Put the butter in a frying pan over a medium heat and cook until melted and beginning to brown. Add the leek and mushroom mixture and fry for about 5 minutes, until the leek is soft and translucent. 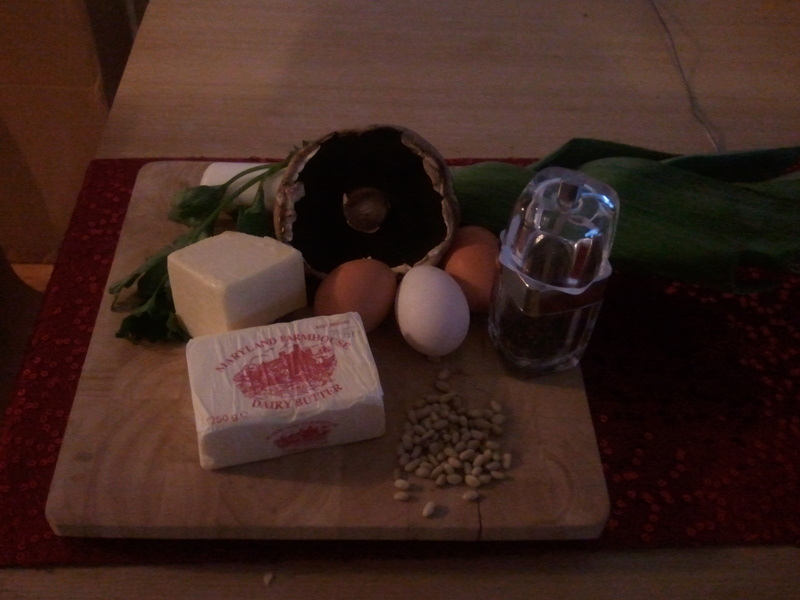 Add the pine nuts, and cook for a another 2 minutes. While the mixture is frying, cut the eggs in half lengthways and remove the yolks. Mash them up with the back of a spoon and add to the mixture in the frying pan. Stir to combine, and then leave to cool slightly. Arrange the mixture in the eggs, and serve either hot or cold. Next time, I am hoping to do something with quinces, since I’ve seen some in my local greengrocers and they look very tempting.